When I was a kid, I was awestruck by the big box of crayons with the tiny sharpener in the back. It was magical–just peel a bit of the paper away, spin it through the sharpener, and the crayon was sharp again. Heaven! 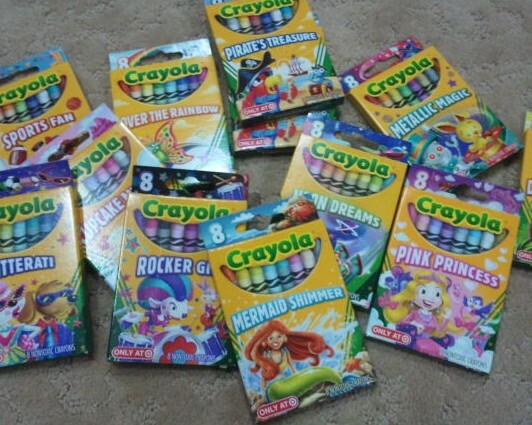 The box provided colors called cornflower, goldenrod, and orchid (the links go to the Crayola color chart). I wasn’t restricted to the usual 24 colors. Oh, the silver, gold, and copper colors…sigh. Check out the Crayola color timeline. I didn’t know some colors have been retired and others renamed! A certain someone in our house can’t stand the smell of crayons, so we color when he’s not around. The little one has learned that the dogs find them yummy, so she doesn’t leave them out anymore. The crayon drawer is crammed with Crayola because we’re crayon snobs. I’m a sucker for cute packaging and new colors. Do you have a favorite childhood toy that you still get to play with because you have children in your life to give you the excuse? Do you even need an excuse? Do you have a favorite crayon color? On the flip side, do you have a childhood toy that you can’t bear to see or smell?